"Evora" redirects here. For other uses of Évora and Evora, see Évora (disambiguation). 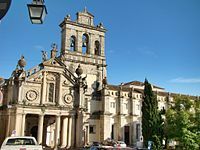 Évora (Portuguese pronunciation: [ˈɛvuɾɐ] ( listen); Proto-Celtic: *Ebora) is a city and a municipality in Portugal. The population in 2011 was 56,596, in an area of 1307.08 km². 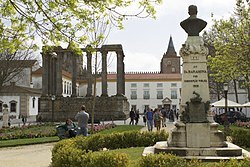 It is the seat of the Évora District. The present Mayor is Carlos Pinto de Sá of the CDU coalition. The municipal holiday is 29 June. Évora is ranked number two in the Portuguese most livable cities survey of living conditions published yearly by Expresso. It was ranked first in a study concerning competitiveness of the 18 Portuguese district capitals, according to a 2006 study made by University of Minho economic researchers. The Foral of Évora of 1501, when the city was favoured by Manuel I of Portugal. 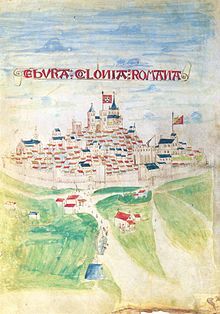 A depiction of Évora in 1503, when the city was blooming with Manueline riches. The etymological origin of the name Ebora is from the ancient Celtic word ebora/ebura, plural genitive of the word eburos (yew), name of a species of tree, so its name means "of the yew trees." The city of York, in northern England, at the time of the Roman Empire, was called Eboracum/Eburacum, named after the ancient Celtic place name *Eborakon (Place of Yew Trees), so the old name of York is etymologically related to the city of Évora. Alternative hypotheses are that the name is derived from oro, aurum, (gold)  as the Romans had extensive gold mining in Portugal; or it may named after ivory workers because ebur (genitive eboris) was Latin for ivory. It may have been capital of the kingdom of Astolpas. See Ebora Liberalitas Julia for more on Roman Evora. 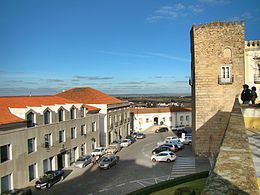 In the 19th-century, Évora declined in national power, as a result of the War of Two Brothers. View of a street in Évora. 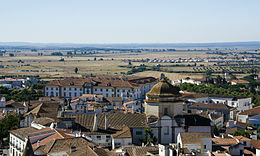 Évora has a hot-summer mediterranean climate. As typical of the interior Alentejo, Évora is prone to severe heat extremes with an all-time record of 46 °C (115 °F). However, the average summer high usually is around 30 °C (86 °F), which is significantly less severe heat than being found in nearby Andalusia, Spain. This is due to low-scale maritime effects due to the relative proximity to the Atlantic Ocean, which also causes seasonal lag predominantly during the warmer period, with night-time temperatures being milder in September than June as well as in October compared with May. Frosts in winter are frequent but not usually severe, snow falling only twice a decade. Mean temperatures throughout winter most often staying below 10 °C (50 °F). Largo das Portas da Moura. Due to its extensive historical and cultural importance, Évora, as well as the surrounding area, has seen in the past few years a great increase in the tourism sector, which fomented the creation of many hotels, bed-and-breakfasts and various other styles of accommodation. 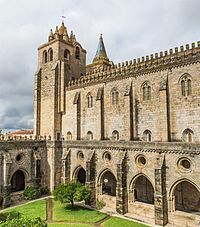 Some of its most visited sites include the Roman Temple of Évora, the Chapel of Bones, the Cathedral of Évora, Évora's Museum and its historical centre. Church of Nossa Senhora da Graça. Palace of the Dukes of Cadaval (Portuguese: Paço dos Duques de Cadaval/Palácio dos Duques de Cadaval), a 17th-century palace, built from the remains of an old castle (burnt down in 1384), and later serving as Governors and Royal residences. The palace includes Manueline-Moorish architectural elements (including the Tower of the Five Shields), and whose first-floor houses a collection of manuscripts, family portraits and religious art from the 16th century. Gaspar da Cruz (c.1520–1570) a Portuguese Dominican friar who traveled to Asia and wrote one of the first detailed European accounts about China. Carla Matadinho (born 1982) a Portuguese model. ^ MAETN (1999). "diktyo". classic-web.archive.org. Archived from the original on 22 October 2005. Retrieved 19 May 2011. ^ "York's ancient origins". Yorkshire-england.co.uk. Retrieved 2013-03-12. ^ "The Mineral Industry of Portugal in 2002" (PDF). Retrieved 2009-07-08. 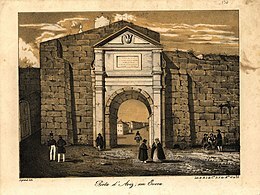 ^ "Évora". Fikeonline.net. Retrieved 2009-05-06. ^ "Evora, Portugal Climate Summary". Weatherbase. Retrieved 7 March 2015. ^ "Climate normals 1981-2010 - Évora". Portuguese Institute of Meteorology. Retrieved 7 March 2015. ^ "Climate Normals - Évora 1981-2010". Portuguese Institute of Meteorology. Retrieved 7 March 2015. ^ "Evora Climate Normals 1961–1990". National Oceanic and Atmospheric Administration. Retrieved 7 May 2015. ^ Região de Turismo de Évora in Portuguese. ^ Diário da República. "Law nr. 11-A/2013, page 552 46" (pdf) (in Portuguese). Retrieved 10 July 2014. ^ "Fábricas da Embraer em Évora vão aumentar número de trabalhadores em 30%". Económico (in Portuguese). 16 February 2015. Retrieved 12 January 2016. ^ "Franceses projetam nova fábrica de aeronáutica em Évora". dinheirovivo.pt (in Portuguese). 15 November 2015. Retrieved 12 January 2016. ^ "Empresa francesa projecta nova fábrica de componentes para aeronáutica em Évora". Económico (in Portuguese). 15 November 2015. Retrieved 12 January 2016. ^ Guia de Portugal. Estremadura, Alentejo, Algarve. Ed. F. C. Gulbenkian, 1991. p. 54.